Here is the werewolf ripping his way through an entire base of soldiers. The US army doesn't issue it's infantry with silver bullets, so the soldiers are totally defenceless against the rampaging hulk of teeth, claws and muscles. Bullets rip through the beast's flesh without even slowing it down. Here's a quick little gif to demonstrate my process. 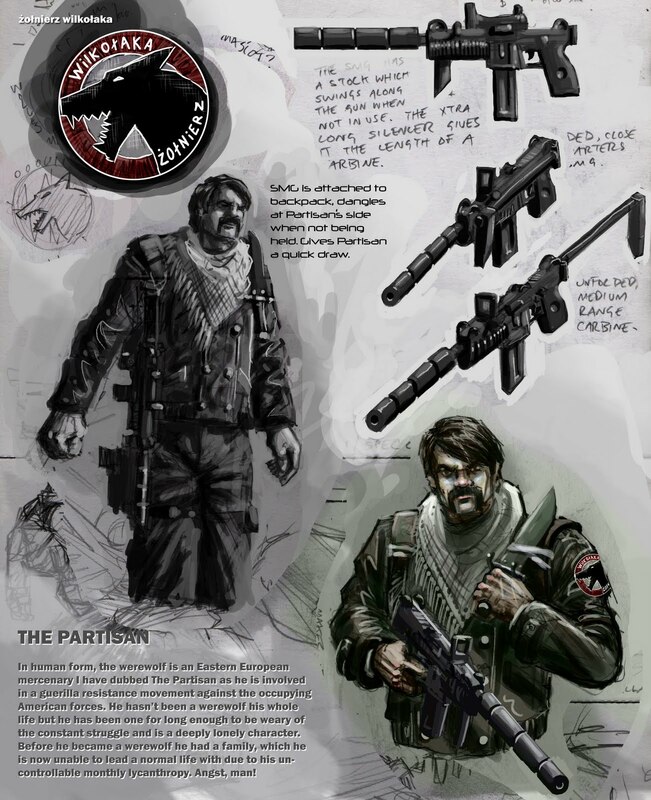 Another sketchbook page scan showing a couple of drawings of The Partisan, one in colour, and the colour version of his patch. The gun was fun, rather than just copying the coolest gun I could find on Google, I delibertately designed it based loosely on several different guns. It was fun trying to think of the form follwing the function, imagining the kind of requirements The Partisan would need from the weapon he took with him. Considering he's gonna Wolf-Out when he gets toi his mission, it was fun coming up with the kind of weapon needed for self defense/small skirmishes en route to the bloodbath showdown. 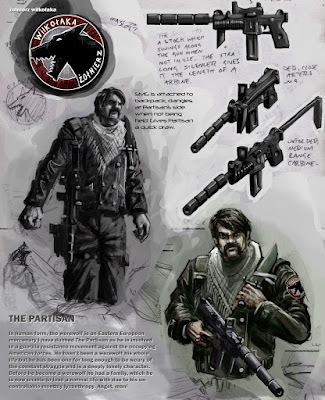 Text taken from the page: "In human form, the werewolf is an Eastern European mercenary I have dubbed The Partisan as he is involved in a guerilla resistance movement against the occupying American forces. He hasn’t been a werewolf his whole life but he has been one for long enough to be weary of the constant struggle and is a deeply lonely character. Before he became a werewolf he had a family, which he is now unable to lead a normal life with due to his uncontrollable monthly lycanthropy. Angst, man!" A sketch from yesterday of the Partisan, which I doodled during lunch break then painted today before getting ready to go out to work. As well as to further practice drawing this fairly generic "tough guy with a 'tache" character, the other focus of this sketch was to further examine the way he attaches his survival knife to his backpack strap. The answer....sticky tape! But it's also important how the knife is angled away from the body, both for practical reasons for the character to be able to access and unsheath the blade quickly, but also for aesthetic reasons - it gives the character a more interesting shape, and the blade tip ending above the shoulder would also add to the character's silhouette. 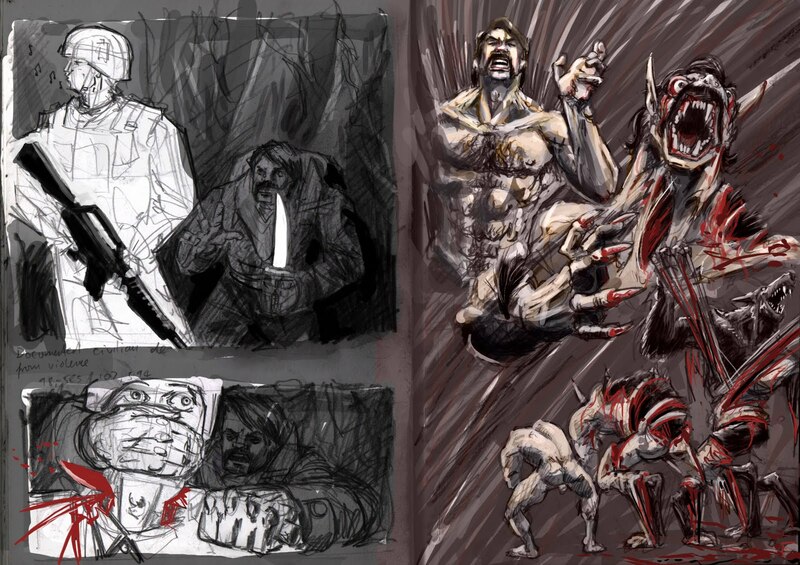 A simple step by step demonstration of the transformation of my werewolf guy. As well as incorporating the bone lengthening and contortion similar to other werewolf transformations, this werewolf sloughs off his human flesh in blatant excuse to draw disgusting ripping things. 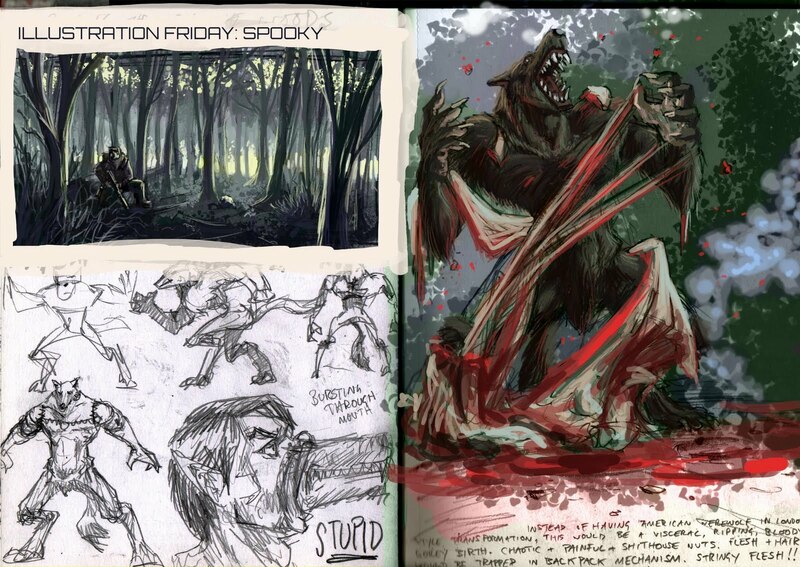 His skeletal system twists and stretches to assume the wolf's shape and increased size, but the hair doesnt simply sprout from his normal skin as it does in An American Werewolf In London. I am amused that stage three looks a lot like Tom Cruise. 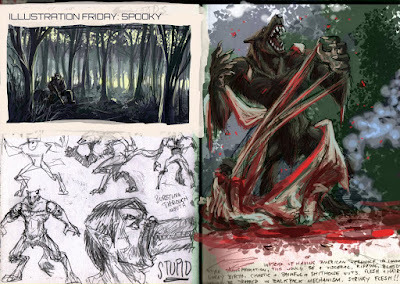 I am still working on my WEREWOLVE$ project, and this sketchbook scan has also been submitted to Illustration Friday for the spooky forest concept in the top left. 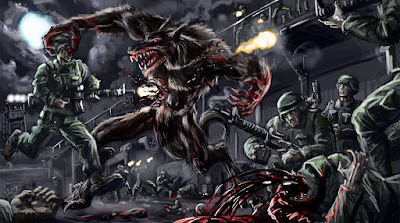 The werewolf ripping it's way free of the soldier's meat is also quite appropriate for Halloween...? The story takes place in an undisclosed Eastern European country. This post-soviet state is suffering under American occupation, and our hero is a partisan who has been despatched to engage an American military base in guerilla warfare. 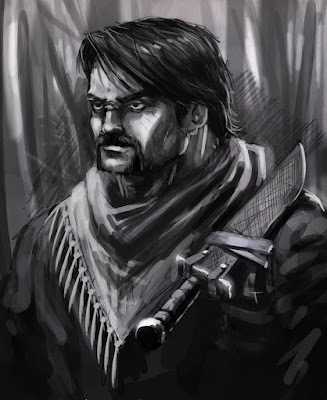 The reason why this lone-wolf assault on an entire American military base isn't a suicide mission is because the lone wolf is literally that: a werewolf soldier. Have been tinkering with a Werewolf story idea under the working title 'Werewolve$' with reference to the John Steakley book Vampire$ of which I am a massive fan. Vampire$ is a book about a Vatican-funded team of vampire hunters, which makes a passing reference to a similar group of people charged with tackling werewolves. 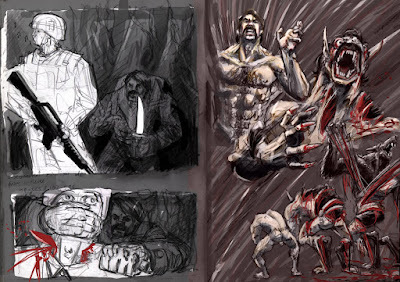 Steakley's own personal demons prevented him from ever expanding this werewolf concept into a full blown story (or as I am led to believe, a film script) but ever since I read about it, it has been the first thing that comes to mind whenever I think about Werewolves. 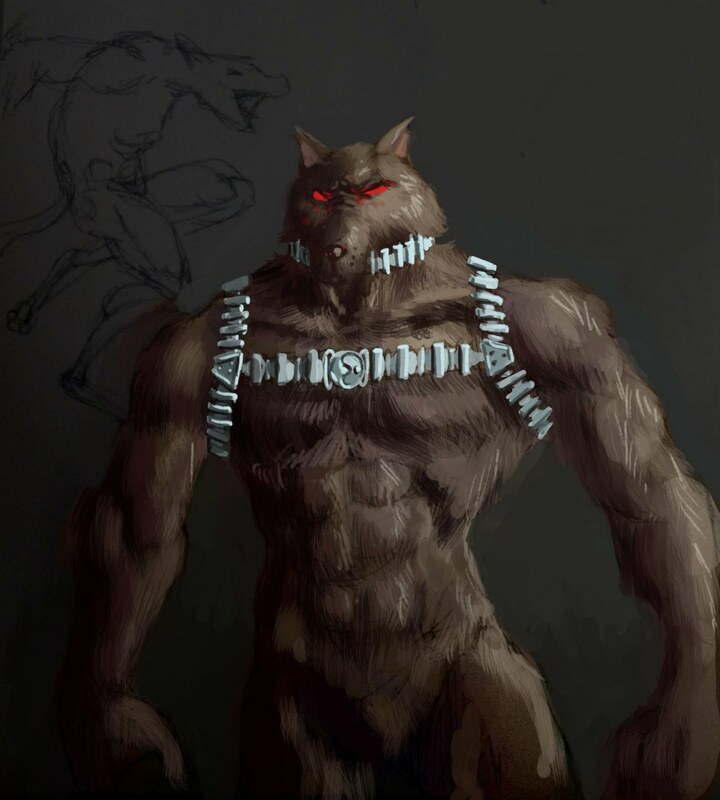 My idea is based on a special forces soldier who is a werewolf. 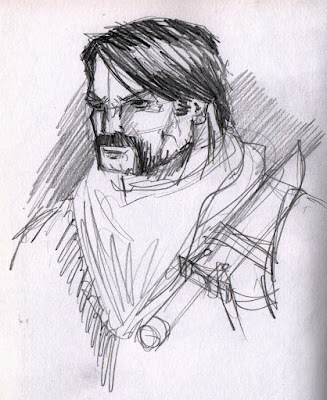 It would make him a perfect soldier, able to heal quicly and possessed on unlimited strength, speed and ferocity. Almost unstoppable. But remember in An American Werewolf In London, he wakes up in the Zoo with no idea where he is, or how he got there? Same here. When he transforms into a wolf he isnt a soldier anymore. He's just a monster. A monster who care nor understands a thing about the mission. A almost perfectly useless soldier. 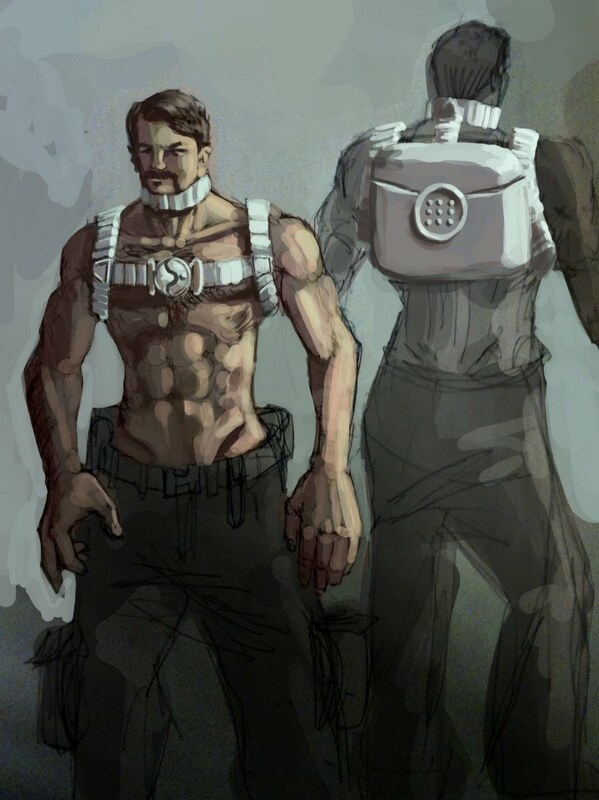 He has to strap himself with a metal backpack containing clothing and weapons for when he awakes. It is made of metal to withstanding the pummelling a night of werewolfing would subject it to. It has expanding metal staps like a steel watchstrap to accomadate the werewolf''s vastly increased physical proportions.